A couple of weeks ago we gave a talk at The Big Feastival – Jamie Oliver and Alex James’s foodie festie in Oxfordshire. We were so touched to be asked and had the best time – as you can imagine the food there was top notch and we ran around like little piggies eating far too much, and loved every mouthful. The best was Breddos tacos – a food truck who we are now obsessed with and we are deffianatly going to order their cookbook. 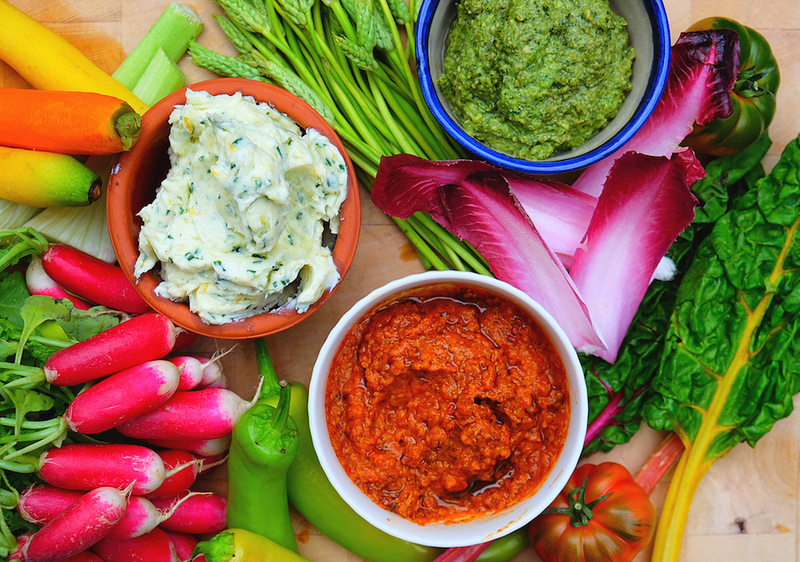 Our talk was based on Tarty dips, dressing and salsas – so often form the basis of some of our favourite recipes. The way we approach a dish or dishes (if putting on a spread) is to think about not just taste, but so many other things as well - texture, coulour, hot or cold, sweet or sour, spicy or creamy – thinking of ways to excite a dish, ways to make it look beautiful, all of these factors are important. An easy way to achieve this is through a punchy dressing or some sort of sensational, mouth tingeling sauce. And we are not just talking about salads – they are a great way to jazz up some boring veggies you have taken into work, used as a dip, left as a marinade over fish, chicken on meat or even give a new twist to an old favourite. Here, we are sharing three of our favourites and they are incredibly easy to make. Chopping by hand is great but we have to tell you that we would be lost without our food processors – and they do not have to be the most expensive top of the range machines, you can pick up some reasonably priced ones these days. Two of the recipes below are blizzed up in seconds in our trusty old whizzers. The Jalapeno avocado pesto is one of our Tart classics. We came up with the recipe at our Pop up restaurant last year and we still use it all the time. It works very well dolloped over sweet potatoe wedges, added to any salad or simply just as a dip with some crunchy vegetables. The Smokey Harrisa is very good with an avocado bruschetta and poached egg in the morning. Lastly, the whipped goat's butter is a wonderful dip for radishes (tip from Jemimas Mum) and we often serve as a canapé. Jalapeño avocado pesto Place all ingredients in your food processor and whizz till puréed. Whipped goat's butter Whisk the goat's butter in a bowl with an electric whisk until light and fluffy, then add the goats cheese and whisk for a minute till blended. Add the celery salt, chives, lemon zest and seasoning and belnd with the mixture. Smokey Harissa 1.Preheat your oven to 220c. Place all the oven ingredients on a baking tray and drizzle with olive oil, sprinkle with sea salt and pepper, and give a good mix. 2. Roast for about 20 minutes, until starting to blacken. Then turn down the heat to 180c and cook for a further 30 minutes. Take out and allow to cool. 3. Dry roast the coriander, cumin and caraway seeds in a pan (stove or oven), making sure not to burn- grind the seeds to a fine powder. 4.Take the garlic out of their skins and place in the food processor. Add all the other ingredients, except for the almonds and whiz to a puree. Finally add the almonds and quickly blitz – keeping them course for texture.